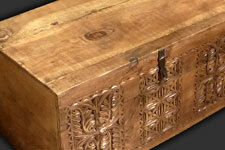 Uri Jacobi has established himself for over 20 years in Chester. Uri is a well-known name in the industry, and is a third generation carpet dealer - with a wealth of knowledge aspiring from inherent family blood ties, evolving from his Father’s origins from Persia and his Mother’s from Russia, who both had a deep involvement in carpets in their lives. 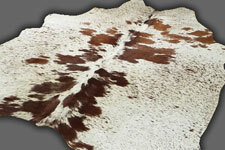 We have a superb selection of stunning hand-made Oriental carpets and rugs from all over the world, including Tribal rugs, Afghan Ziegler rugs, Kazak rugs, runners and large carpets. Visiting our store or browsing our website is akin to a trip to an art gallery, except that our works of art cover the walls and floors. The choice is breath-taking, and the array of patterns, textures and sizes will enhance the good looks of your home, no matter its age or style. Talk to Uri about your needs and he will share his experience to help aid you in your selection. 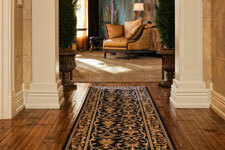 If you've ever seen a Persian carpet, you know it's a beautiful work of art. 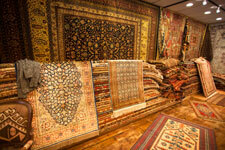 But what distinguishes a Persian carpet from others? Well, the name Persia refers to a part of the world that includes Iran and Turkey, both once part of the Persian Empire. It's a region famous for rug weaving. But how is it made? By weaving, a process of creating a textile by interlacing threads. Weaving is done on a loom, a frame-like piece of equipment that holds two basic types of threads. Warp threads run vertically, attached to the loom frame and held in tension. 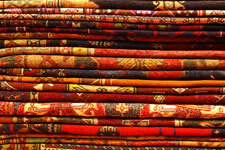 Most Persian carpet are made by hand, and their width is determined by the width of the loom on which they are made. 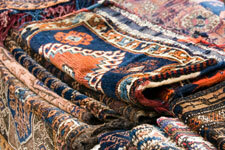 Persian carpets may be made of natural fibers like cotton, silk or wool. 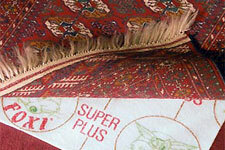 Another type of Persian carpet is a flat weave rug known as a kilim. 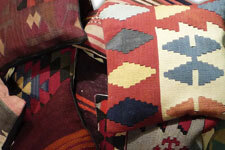 These rugs don't have knotted pile and they use many special types of weaving techniques that involve skipping a certain number of warp or weft threads to make designs. One of these techniques is called slit weaving, in which gaps are left between the boundaries in the weft threads of colour blocks that are woven to form the patterns on the carpet. Another method, called dove tailing, connects the borders between colour blocks by interlocking weft threads. This creates blurrier edges to the design.